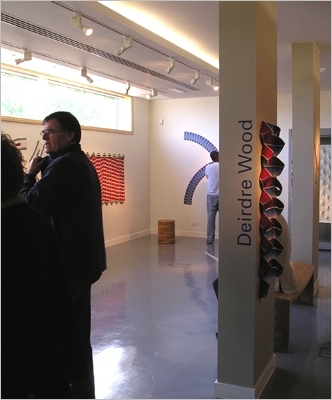 Following on from the excellent Sophie Roet exhibition of designer-craft textiles at the Crafts Study Centre, Farnham, Professor Simon Olding has executed another ‘quiet coup’ with the very different – but no less intriguing – Deirdre Wood textiles exhibition titled ‘straight and narrow’. There is a growing excitement for me as a textile ‘season’ at the Crafts Study Centre begins to open up towards subsequent shows promised by Jilly Edwards and John Hinchcliffe through into 2006. In relation to the extensive textile archives held at the Crafts Study Centre each of these shows pose questions related to the archival material and simultaneously challenge its conventions. OK, ‘straight and narrow’…childhood memories of being told to keep to the ‘straight and narrow’ path, that cleanliness was next to godliness, and that the wages of sin is death. There can be, in certain circles, a kind of ‘craft Puritanism’ that echoes this kind of dogma: “Keep your warp straight and your vision narrow, and nothing can go wrong!” Well, Deirdre Wood’s woven wall pieces playfully subvert this, rigorously operating within her own articulation of crafting, and it all comes delightfully intelligently right! The stairwell entrance to the gallery tantalises a visitor with small textile pieces mounted flat to the wall, but intriguingly curved on the warp in a dazzling display of technical excellence. These works are titled straightforwardly – Terra-Cotta Cross with Green Squares, for example – operate like calligraphic signs. This cross is less a cross as we know it, than a mark that feels hand-drawn, quick, sketched, and then rearticulated in a slower medium, that of densely woven fabric. We are told matter-of-factly that this particular work is made from linen, spun silk and worsted Wensleydale, and all of the works are labelled in detail with the materials used to make them. This type of information situates this practice within the materials and techniques of a craft-based weave practice, and the accompanying booklet narrates Wood’s lifetime immersion in the territories of domestic ceramics as well as a key interest in West African textiles. 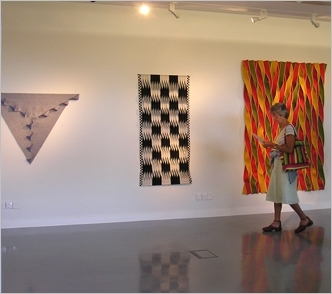 Large-scale pieces such as Four-Legged Structure have all the energy and exuberance of Malian cultural artefacts, but repositioned in contemporary Western (Southern English) textile practice. That piece pulses optically with graduated striping, and a wheeling curvateous energy. A similar musicality and vitality is present in Nineteen Spaced Arcs with Dip-Dyed Details in which the elements are composed on the flat white space of the wall to create a harmonised but vibrating work of impressive dimensions. And the textual accompaniment informs us that it is the different shrinkage rates of linen and silk that allows the fabric to curve during its wet-finishing after weaving. I am a weaver by training, yet I was caught up in the excitement and excellence of the production here of curved woven segments. The magic of not knowing, forgetting, or not wanting to know how something is done helps me to suspend my technical scrutiny of works, and allows me to appraise them firstly on their aesthetic and emotional affect. I am better-informed by the addition of the text, but my memory of the works now as technically wonderful pieces, rather than as fabulously curved textiles is the lesser for the explanation. Construction, the fundament of weave, is both a making term and a concept within Wood’s practice. Constructed woven fabric, related to the strip weaving and narrow cloth techniques of Malian textile production, is twisted and then re-constructed into larger, relief works like Triangular Blue and Grey Construction. In this and works in the same vein, Wood subverts the flatness and the parallel edging of conventional weaving in rippled, latticed, snaking combinations of long woven strips. These can be rather more sombre or sober than the curved weavings. They are stricter, more obviously stripy and their references feel more Western, more English, more located in fine art optical practices. It is significant, on a subtle level, that these are textiles. Wood has employed the textile possibilities offered by ikat dyeing of warps and the selection of variously coarse, matt, or lustrous yarns for surface effect to add significantly to the content of these works. I can only imagine seeing the bold and colourful geometries of Malian cloths within their own context and in the hot Malian sun. 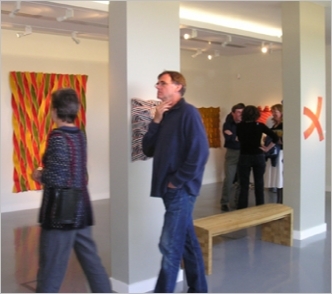 Wood’s travels in this territory in the early 1990s inform in some sense all of the works produced here. There must then be a strange moment of translation in the return from Africa to the much greyer light of England…from primary-coloured weave strips to striped awnings and deckchairs maybe…and to the very different cultural and traditional interaction with textiles indigenous to here. I continue to find the titles a little self-consciously unembellished, and given Wood’s joyous engagement in the making and design of the works, they are perhaps a little undemonstratively named for this self-confessed lover of the lush. This, for me, is the signifier of that translation from Africa to England, and I am interested in how it has manifested in this practice. Nevertheless, there is poetry in the plain as much as in the decorated, and this ‘straight and narrow’ has its essential beauty too.